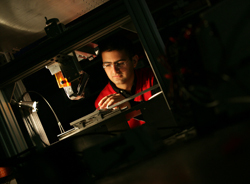 ISR-affiated Ph.D. student Nima Ghalichechian is one of the recipients of the 2006 American Vacuum Society's (AVS) Graduate Research Award, a prestigious nationwide competition. The award recognizes the quality of the body of research of individual graduate students. Nima, an Electrical and Computer Engineering student, is advised by Associate Professor Reza Ghodssi (ECE/ISR), who comments, "This is indeed a great honor for our research group, ECE, ISR and the University of Maryland." The AVS award will be presented at the AVS 53rd International Symposium in San Francisco this November. Nima also will present his most recent work at the 2006 Solid-State Sensor, Actuator, and Microsystems Workshop, at Hilton Head Island, S.C., June 4-8, 2006. The title of his workshop paper is "Dynamic Characterization of a Linear Variable-Capacitance Micromotor." Nima is the second student from Ghodssi's MEMS Sensors and Actuators Lab to be honored with the award in four years; Ph.D. student Alireza Modafe, who expects to graduate this summer, won in 2002. He also is advised by Dr. Ghodssi--who coincidentally won this same award in 1995 when he was a graduate student at the University of Wisconsin.